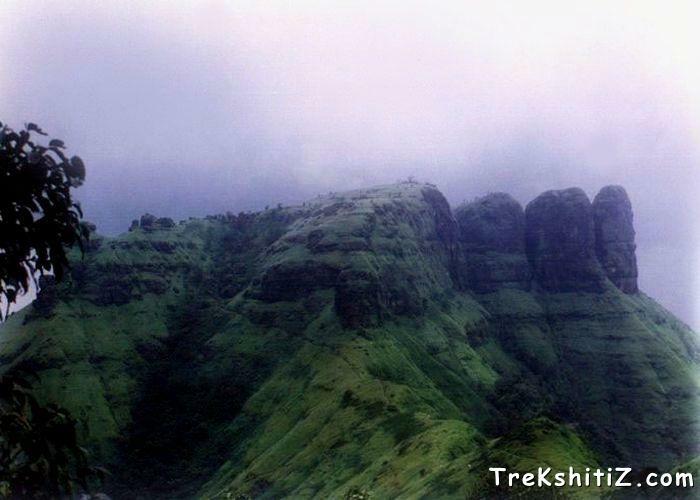 Tahuli comes under regions of Kalyan, Karjat and Panvel. Tahuli cannot be called as a fort. It is famous mainly for its three pinnacles. Heighted pinnacles and difficult ways render Tahuli significant one. However, the significance itself makes Tahuli neglected place. At the top we see an Ashram of Gaadge Baba Maharaj. Two more Ashrams are seen on this way. The uppermost part of the plateau is called as �Dadimaa Tahuli�. Here we see 5 Peer (Islamic holy place) and opposite to it, a small house. After 2 hours further, by same way, we reach at base of the pinnacles. One pinnacle is called �Daood� and other �Baman�. Alight at Kushivli gaon stop. It is on Kalyan-Malang Gad road. The way towards Tahuli goes near the village. It goes from a gap between two mountains. Two and half hours are required to reach at the top from Kushivli village. Another way is from Ambernath. From Ambernath one should reach Badlapur road. After crossing this road we reach at Kakuli Lake. From the lake, a trunk on the mountain takes us to the pinnacles. By this way we reach at the top after 4 hours trekking.